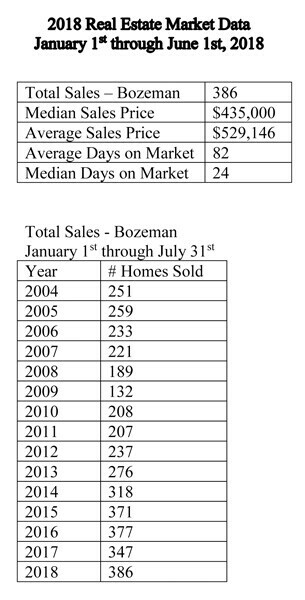 More homes have sold in Bozeman during the first 5 months of this year versus last; 386 homes in 2018 versus 347 in 2017. Inventory remains limited, so it often feels like there are fewer homes to buy, and the demand in Bozeman remains strong. As such, we’re continuing to see multiple offer situations. In these situations, buyers that aren’t able to pay cash often lament their inability to be competitive. As I’ve done in years past, I thought it prudent to compare the percentage of cash sales over the years. Looking at cash-only transactions: For sales of single family homes in all of Bozeman between January 1st and June 1st of 2016, 90 out of the 377 homes sold were purchased with cash. That is approximately 23.9% of all sales. This nudged down slightly last year to 74 out of 347 sales, or 21.3%. For 2018, 102 out of 386 sales, or 26.4% were cash purchases. This is the largest percentage I’ve seen since I’ve started tracking this number. Even though it edges slightly up and down over the years, the percentage of sales is generally fairly consistent. In 2015, 85 of the 371 sales during the first 5 months were cash, or 22.9%. In 2014, it was 70 of the 318 sales, or 22% and in 2013, 61 of the 276 sales, or 22.1% were cash purchases. The downtown area, which is attracting a lot of out-of-state buyers, has one of the higher percentages of cash-only transactions. Twenty two out of 71 single family homes purchased were bought with cash, or 31%. Looking at downtown condos, 16 out of 33 sales, or 48% were cash purchases. Buyers who don’t have cash and end up in multiple-offer situations can still try to be competitive. At the end of the day, most people still prefer more money in their pocket, so there’s a good chance that a higher offer with financing could beat out a lower offer with cash, but not always. Buyers can also do their best to make their offer as attractive as possible by closely analyzing their contingencies and all the terms of their offer. While it can certainly be risky, I’ve seen sellers choose offers that were $20,000 less than another offer because the winning offer lacked an inspection contingency. As usual, I have included data for the number of single family homes sold during the first five months of 2018. In addition to the 386 single family homes sold during this time period, another 189 homes are currently pending, or under contract, as of the date of writing this article. The included data reflects sales of homes in the greater Bozeman area, including Four Corners, Gallatin Gateway, Bridger Canyon, and Bozeman city limits. The data includes home sales reported through the local Big Sky Country MLS, and does not include private party sales, Condominiums, or Townhouses.